Approaches to the True Goal of Yoga (Part 1) is the first in a series of articles on the unity of all the different "approaches" to the "true" goal of yoga (which IS yoga or union). These articles will be written in an effort to elaborate on the attainment of "Self-Realization," which is the direct experience of the center of consciousness (aka; the Self, the Atman, the Purusha and the Absolute Reality). This “Self-Realization” becomes available to the student or devotee through the study and meditation on the Yoga Sutras of Patanjali, the contemplative insight of Advaita Vedanta, and the intense devotion of Samaya Sri Vidya Tantra. These three complement one another like fingers on a hand. They employ the classical approaches of Raja, Jnana, Karma, and Bhakti Yoga, as well as Hatha, Kriya, Kundalini, Laya, Mantra, Nada, Siddha, and Tantra Yoga. By systematic and dedicated practice; meditation, contemplation, mantra and prayer can converge into a unified force which may then be directed towards realization of the final stage, the Absolute. Western civilization’s perception of yoga has shifted significantly in recent years from the traditional yoga of the ancient sages to the modern revisions. In recent times the relative position of the asanas (postures) has been elevated. This view leads people to believe that the word "yoga" refers mainly to the physical postures or asanas, and that the goal of yoga is primarily physical fitness. This is terribly misleading and confusing to most people about the true nature of authentic yoga. In the US we now have millions of people who totally believe that yoga is akin to a gymnastic exercise or a physical fitness program. Most modern day yoga doesn't specifically require one to practice for any kind of spiritual awakening, although it can be used to further that purpose. The physical aspects of yoga asana have become popular in western culture largely due to their numerous benefits including stress relief, increased flexibility, detoxification of the body, and injury prevention/recovery. "Traditional yoga" has historically been taught orally, and there are subtle nuances among various lineages and teachers. Principles are often communicated in sutra style, where brief outlines are expanded upon orally. For example, yoga is outlined in a total of 196 of Patanjali’s Yoga Sutras and then each sutra is discussed, explained, and commented on by a teacher to the student. Likewise, the great depth of meaning of Om mantra is outlined in only 12 verses of the Mandukya Upanishad but is expanded upon orally. More than 10% of the 700 verses of the Bhagavad Gita contain the word “yoga,” yet only the sacred oral traditions allowed these lessons from the “Gita” to illuminate from within. When modern yoga classes and studios teach asana to the exclusion of profound spiritual discipline and practice, the student may never realize that (according to the ancient sages) the entire purpose of Yoga is spiritual in nature. 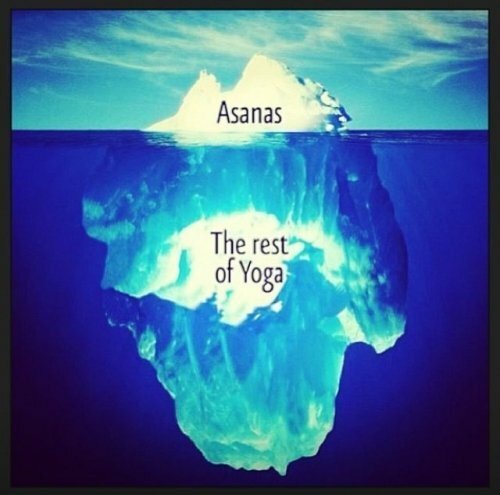 It is unfortunate that the word "yoga" has so often been used in place of the word "asana" or "posture" in recent years. No one would call a brick a "house" even though it is part of the house’s construction. The first word of Yoga Sutras is "atha" which means "now," and that implies a prior preparation. A student may do postures for years and still not be ready for yoga. We could call them "asana classes" and "asana studios" and that would be a great service to people. The word "yoga" could then be appropriately reserved for the journey that the student embarks on when they begin to truly understand the philosophy, science, history and actual nature of authentic, traditional yoga.